Imogen's Typewriter. 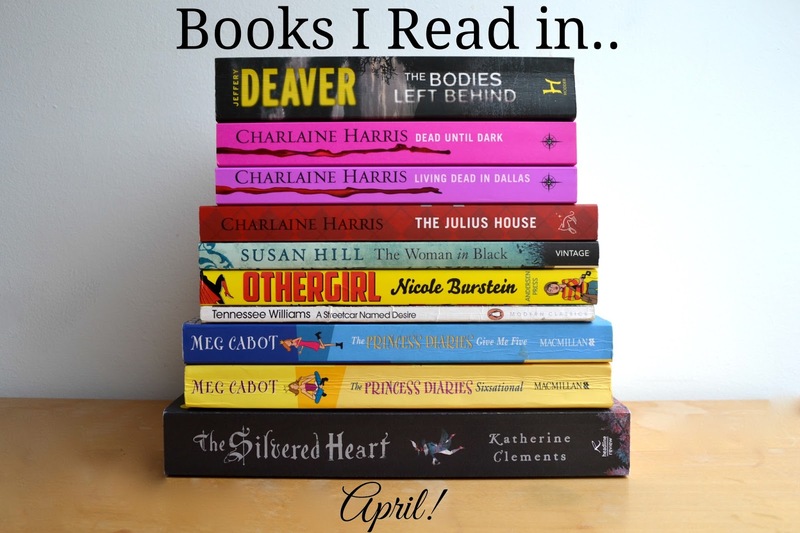 : Books I Read in April! My reading this month was quite good! Ten books is nothing to be sniffed at, don't get me wrong. I'm just wondering if I'm really taking in everything I read, if I need to, and if I'm doing because I enjoy it or because I feel like I have to. Simple existential crisis is all. Either way, I read some really good books this month..
You can read my review of this book here! This is the first of the Sookie Stackhouse/ Southern Mysteries/ True Blood series. I've read the first couple before when I was in my teens and remembered them fondly. So since I finished up the last Charlaine Harris book I had from the Aurora Teagarden series and I wanted more of her writing, I reached for these on my shelf. I loved this book, it covers pretty much the entire of season one of the True Blood show and mixes all the great domestic fluff that Harris does so well with a really unique supernatural world. Personally I can't think of another book I've read that deals with the vampires 'coming out of the coffin'. Although a similar, and just as great series is the Kitty Norville series where Werewolves are made public. The characters were fun and original. They're so real, so ordinary that as all of the murders of 'fangbangers' and horrible things are happening- even with vampires- it's believable that they react like they do. And they're likeable to boot. Well, the ones that are supposed to be. Even some of the characters that are sarcastic and rude are kind of adorable. Also, Sookie says 'neat' a lot like I do which makes me like her more. "You may not think my job amounts to much, but it's one I'm good at, and I like it. I am as worthy of respect as your sister, the lawyer, Andy Bellefleur, and don't you forget it." This wasn't as good as the first book for me. I can't quite put my finger on it, maybe just the whole possessive vampire thing? Bill needs to take a step back and get a grip but also, it's starting to get a bit obvious that Sookie deserves better. This covers pretty much season 2 of True Blood and it all felt a little rushed, but then again, Sookie probably feels the same about the developments in her life. Being made to go to Dallas to help out vampires is probably not her dream job. Bill just gets on my last nerve and it felt like Sookie was a little less defiant than the first book, but only a little. It's still a great book that I really liked. I also enjoyed the little looks into the vampire hierarchy and the integration into human life; for instance, the idea of a legislature bill for a vampire being Texas's executioner of the state is just so amazing. "I didn't tell him I'd learned that from reading a mystery. Let him think I read ancient Greek Literature in the original language." This was a great book! It's a kids book but the premise really stood out to me as something I would want to read. Basically the protagonist is a superheroes best friend. And has to deal with jealousy, worry, the fine line between helping and controlling- all while dealing with her own problems like her upcoming GCSE's and the boy she likes. And she deals with them like a real teenage girl would. So much of this was familiar to me from my own childhood that I was super impressed. But it wasn't just another typical teenage drama problem because this is a world where superheroes are out and about. It tows the line of relatability so perfectly while letting it all be exciting because of the superpowers that I think it puts across the message of good friendship and good choices without being obvious and putting young readers off. Nicole is clearly a comic book fan too, it shows and I love it. A character even makes a nod to the Golden Age of comic books by calling the past the 'Golden Days'. As a fan myself, I love it and I think that the passion for superheroes shines through. This would be a great transition book for kids that don't really read novels but love comic books. To be honest, it's an all around great book for younger teens that I really recommend. "I just want you to remind me, in case I ever become silly to the point of no return, that nobody cared what the amazing Clara looked like, OK?" I mentioned in a past round up that I'm currently working on making my characters speak in my degree. Well, it came to working on accent so I pulled out my (stolen from my old school, whoops) copy of A Streetcar Named Desire because the accent differences with Blanche- the Southern Belle protagonist, and Stanley- the working class antagonist, is just amazing. You can see the accent without going to extreme measures- looking at you Trainspotting. The story and development is strong too and seeing it performed is one of my favourite memories of my Theatre Studies A-level. Reading it isn't quite as fun as other plays I've read but it's a solid story and I think it's one that most people should read/see at least once! "Physical beauty is passing. A transitory possession. But beauty of the heart and richness of the spirit and tenderness of the heart- and I have all those things- aren't taken away but grown"
*I received this for review.